QUANTICO, Va. — Call it a playground for Bambi and G-Men, where imaginary criminals are hunted and deer are the spectators. 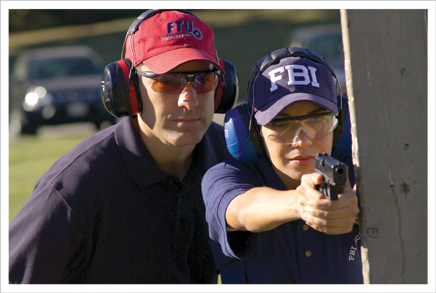 The 547-acre FBI Academy, where some of the nation’s best marksmen fire off more than 1 million bullets every month, happens to be one of the safest places for deer during hunting season. The property on the Marine Corps base in Quantico, Va., is home to some of the FBI’s most elite forces and training programs as well as a de facto wildlife refuge where deer, fox, wild turkeys, groundhogs and vultures roam fearless and free. In recent years, a black bear was spotted running across a parking lot, and a groundhog cornered an FBI agent coming out of the cafeteria, hoping to score some human food, FBI spokesman Kurt Crawford said. Turkey vultures are often seen perched atop the 500,000-square-foot national crime lab where the FBI analyzes evidence, including the remains of the former al-Qaida leader in Iraq. Posted: 12/27/11 at 6:11 AM under FBI, News Story.